Burger King is trouncing McDonald's in terms of U.S. sales growth this year. NEW YORK (TheStreet) -- The King is flame-broiling Ronald McDonald's hide in the U.S. this year on the back of more successful new sandwiches and stronger marketing. "We are seeing growth across multiple dayparts," said Restaurant Brands International (QSR - Get Report) CEO Daniel Schwartz on a call with analysts on Monday regarding strong second-quarter sales at Burger King U.S. Restaurant Brands also owns the Tim Hortons coffee-and-donut chain. Schwartz has won plaudits on Wall Street for having completely turned around the ailing home of the Whopper since assuming the CEO role in June 2013, primarily by speeding up the pace of remodels and focusing on bolder marketing and new menu items. Those moves continued to pay off in the second quarter. "The sales results reflect restaurant 'reimages,' the introduction of more impactful products, and a broader marketing message," Schwartz said. Burger King found success with its new A.1 Hearty Mozzarella Bacon Cheeseburger and Extra Long Pulled Pork Sandwich. Chicken Fries, brought back in August 2014, also continued to be a hit amongst consumers. Schwartz said the focus on fewer items has also helped make it easier to quickly prepare customers' food. 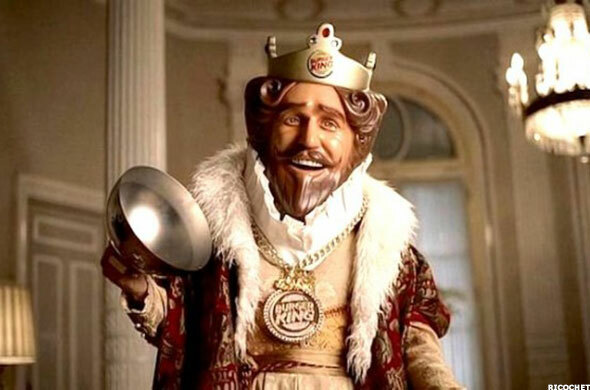 Further, Schwartz attributed part of the strength in the quarter to the return of Burger King's somewhat creepy King mascot, which made high-profile TV appearances at the Kentucky Derby in June and the Mayweather-Pacquaio fight in May to much social media fanfare. Same-restaurant sales at Burger King U.S. surged 7.9% in the second quarter, quicker than the 6.9% gain grilled up in the first quarter. Burger King's adjusted earnings per share came in 30 cents compared to the 25 cents analysts were estimating. The stock spiked 6.3% in early morning trading on Monday. While Burger King has delivered two very solid quarters on the back of bolder new product introductions and buzzy marketing, rival McDonald's (MCD - Get Report) has been struggling mightily. The Golden Arches is mired in a serious sales slump due to the poor perception of its food quality and fewer exciting new products compared to Burger King, Sonic (SONC and Wendy's (WEN - Get Report). 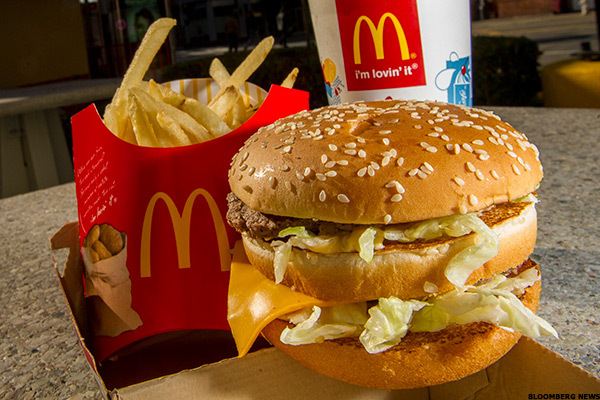 Despite new menu items such as the Sirloin Third Pound Burger and various regional items such as the McLobser in Boston, Mickey D's reported a 2% same-store sales decline in the U.S. for the second quarter, the seventh consecutive quarter of declining U.S. same-store sales. "Results here have been disappointing," conceded McDonald's CEO Steve Easterbrook on a July 24 call with analysts. Easterbrook, who is about six months into the job as CEO of the world's largest restaurant chain, added, "I believe we are making the right moves to begin to stabilize the U.S. business -- but there is no silver bullet, no one move will turn a business that's been in decline for nearly three years and more recovery will be bumpy." McDonald's believes it has lost market share to rivals such as Burger King and Sonic during the daytime over the last 18-24 months, in part because it has deemphasized the popular Dollar Menu. Easterbrook may now be attempting to try a strategy that has worked successfully at Burger King -- namely, keeping things simple. "It's quality over quantity, not a lot of new limited-time offerings," Easterbrook said on the call. Instead, McDonald's will focus on serving "hotter, fresher and juicer" Big Macs and double cheeseburgers as opposed to unveiling new and gimmicky food, that slows up drive thru-times and hurts food quality. One component to Easterbook's plan to enhance food quality includes tweaking how items are assembled by McDonald's workers, such as the way packaging is laid out. The company is also reviewing how it uses technology to get orders to the back of the kitchen in the hopes of removing steps and easing workloads. And more items from McDonald's supersized drive-thru menu may be on the chopping block, following actions taken early in the year to pare it down to speed up service times. The Dow Jones Industrial Average retreats as shares of 3M plunge following an earnings miss and after the company said it would cut 2,000 jobs. The earnings storm continues. Jim Cramer dives in on Facebook, Tesla and more earnings' reports to look at. The company's growth was so impressive, even a Microsoft bear moved his price target up. First-quarter earnings match analysts' expectations and revenue beats forecasts but the stock slumps Thursday. Investors should reduce holdings on shares of Intel if the stock opens Friday below its quarterly pivot at $57.57.